A blog published by Susan Eisen that has columns on all the latest jewelry fashions, news, and store information. Welcome to Music Friday when we bring you wonderful songs with jewelry, gemstones or precious metals in the title or lyrics. 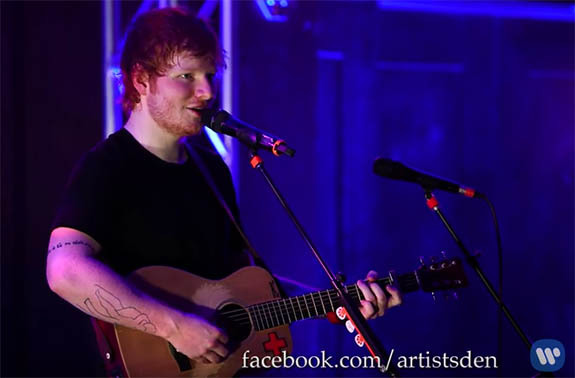 Today, Ed Sheeran carves a heart pendant for his girlfriend in the 2011 love song, "Wake Me Up." "Wake Me Up" is essentially a musical love letter to Sheeran's girlfriend, where the English singer/songwriter outlines all the characteristics and idiosyncrasies that make her so endearing. Sheeran told The Sun, "I picked out every little thing about my ex-girlfriend that I thought was wicked (i.e. awesome) and put it into a song. There's a lyric about New Year's Day on Southwold Beach when I made her a necklace from two bits of chalk, which I carved into a heart." "So I'll take you to the beach / And walk along the sand And I'll / Make you a heart pendant / With a pebble held in my hand / And I'll carve it like a necklace / So the heart falls where your chest is / And now a piece of me is a piece of the beach and it falls just where it needs to be / And rests peacefully / So you just need to breathe / To feel my heart against yours now / Against yours now." "See I could do without a tan / On my left hand, where my fourth finger meets my knuckle / And I should run you a hot bath / And fill it up with bubbles." According to SongFacts.com, Sheeran penned "Wake Me Up" while poolside at the California residence of actor/singer/songwriter/comedian Jamie Foxx in 2010. Foxx had met Sheeran through a chance encounter at an open-mic night and was so impressed by his talent and potential that he invited Sheeran to perform on his radio show and to use his home recording studio. Born in Hebden Bridge, England, in 1991, Sheeran sang in a church choir with his mother starting at the age of 4. He was inspired to pursue music as a career after having the opportunity to chat with Irish singer/songwriter Damien Rice. Although Sheeran was only 11 at the time, he still remembers the profound impact the meeting had on his life. "I had a little bit of a chat and kind of had an epiphany, like 'Wow, this is exactly what I want to do!'" Sheeran told The Telegraph. "I got home that night and wrote a whole bunch of songs. I remember one was called 'Typical Average Teen.' Yeah, I was one of those." At the age of 17, Sheeran moved to London, where he played small venues. In 2010, he bought a ticket to Los Angeles with no contacts or solid leads. All that changed when he met Foxx. Soon after, Sheeran was signed by Asylum Records. His breakthrough song, “The A Team,” was nominated for Song of the Year at the 2013 Grammy Awards. A year later, he was nominated for Best New Artist at the 2014 Grammy Awards. Please check out the video of Sheeran’s live performance of “Wake Me Up.” The lyrics are below if you’d like to sing along. Written by Ed Sheeran and Jake Gosling. Performed by Ed Sheeran. Credit: Image capture via YouTube.com. Sourced in the Appalachian Mountains of North Carolina, four museum-quality star rubies weighing a total of 342 carats will hit the auction block at Guernsey’s in New York City this June. The Mountain Star Ruby Collection will be sold together as one lot and could yield an eight-figure windfall for the family of Jarvis Wayne Messer, the humble fishing guide/rockhound who discovered the gems in 1990. 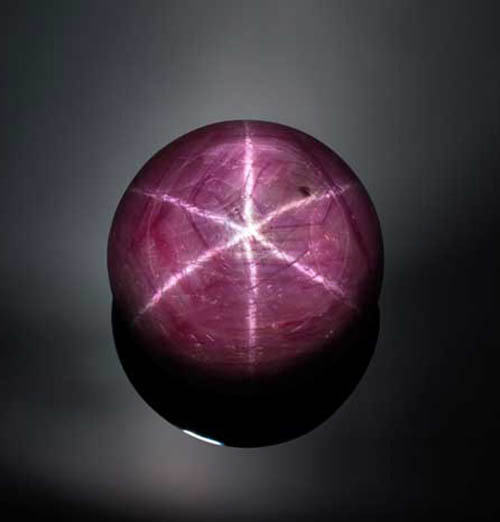 The largest of the four gems, the 139.43-carat Appalachian Star Ruby, has been compared favorably to the Smithsonian's Rosser Reeves Star Ruby, which is one carat lighter. Guernsey’s President Arlan Ettinger told National Jeweler that Messer's find may be superior to the Rosser Reeves because it has six prominent needles, whereas the Rosser Reeves displays only five prominent needles and one broken needle. 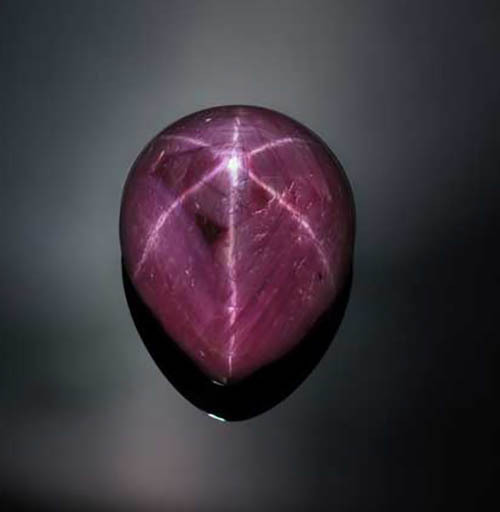 In 1992, the Appalachian Star Ruby made its international debut at London's Natural History Museum, where it drew 150,000 visitors in just a few weeks, according to Guernsey's. 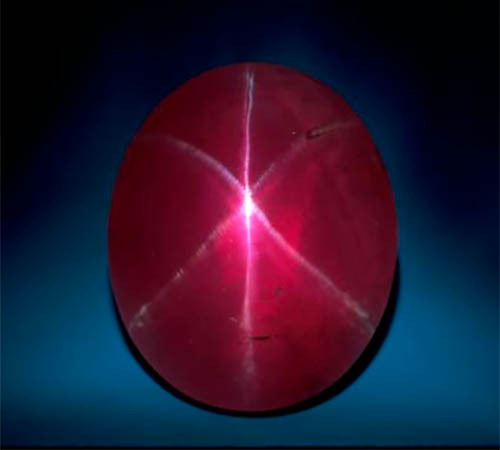 When gem enthusiasts discuss the finest star rubies, they generally invoke the famed gem fields of Burma and Sri Lanka. That Messer sourced his star rubies in North Carolina makes their story that much more remarkable. Guernsey's described Messer as a man of modest means, who made his living as a fishing guide. He also was a self-described rock hound, constantly searching for rare and unusual stones in his native Appalachia. "I started off as a pebble pup at 6 and worked myself up to a rock hound at 13," Messer told the Associated Press in 1994. "What began as a hobby led me to one of the finest jewels in the world." 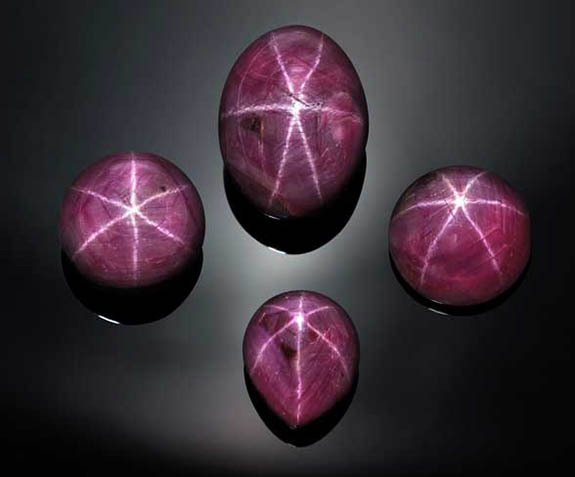 In 1990, while searching an ancient stream bed in a still-secret location, Messer made an unprecedented discovery of four star rubies, including the aforementioned Appalachian Star Ruby and the Smoky Mountain Two Star Ruby, which displays distinctive stars on both the front and back of the stone. 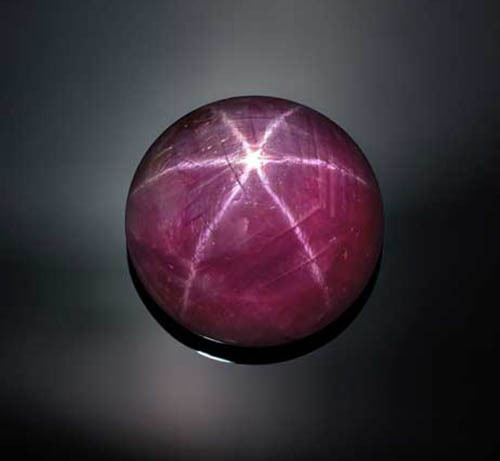 "When I found the [Appalachian Star Ruby] I did not realize how important a stone it would become," he said in the 1994 interview. 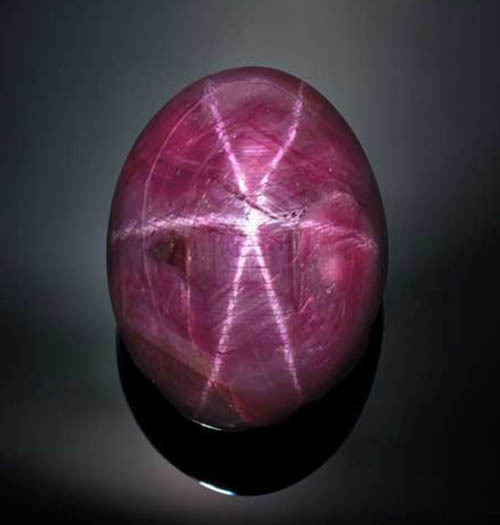 "I knew it was a ruby and a beautiful specimen. But we did not know what we had until we started to cut the stone. I realized what we had found when I made my first cut. The star just popped right out. Right from the beginning I could see it portrayed attributes that no other stone has." Messer passed away in 2008 at the age of 52, and his collection was returned to his family where it has quietly resided ever since. Guernsey’s Ettinger told National Jeweler that it is important to keep the four stones together. “It was suggested to us that part of the extraordinary nature of them is where they were found and their individual brilliance, but also the fact that they are four matching stones and it would be crazy, almost criminal, to destroy the collection and the set,” he said. The collection will be offered without a minimum reserve, and the auction house did not provide pre-sale estimates. Guernsey's hinted that the collection could yield eight figures, using the Smithsonian's Rosser Reeves as a point of comparison. The Rosser Reeves was appraised at $25 million in the early 1980s and about 20 years later at $40 million, according to Guernsey's. Guernsey's has yet to pick a date in June for the sale that will take place live at the Americas Society on Park Avenue in Manhattan. Online bidding will be held concurrently at LiveAuctioneers.com. Credits: Mountain Star Ruby Collection images courtesy of Guernsey’s. Rosser Reeves photo by Chip Clark/Smithsonian. Upstate New York resident Erin Tobin just had her best day ever. 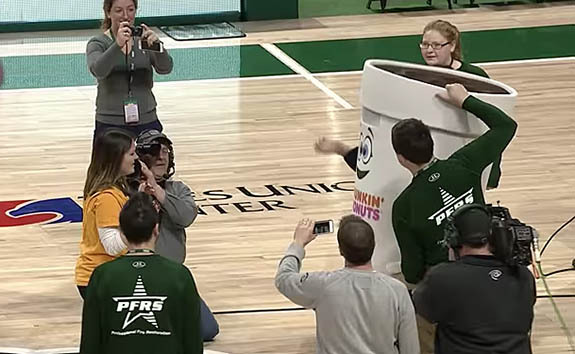 She achieved instant fame when she banked in a half-court shot at a Siena College men's basketball game on Thursday night, not only earning a $500 Dunkin' Donuts gift card, but also a surprise marriage proposal from her boyfriend disguised as a larger-than-life coffee cup named "Cuppy." Actually, the half-court shot promo was staged by Tobin's boyfriend, Steve Duckett. 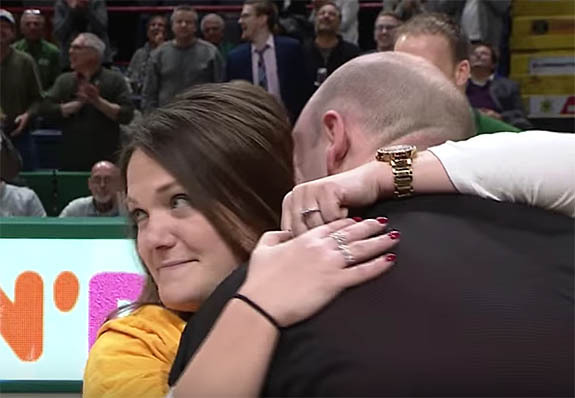 A Siena College season ticket holder, the 31-year-old romantic schemed with the college's PR department to surprise Tobin with an on-court marriage proposal. 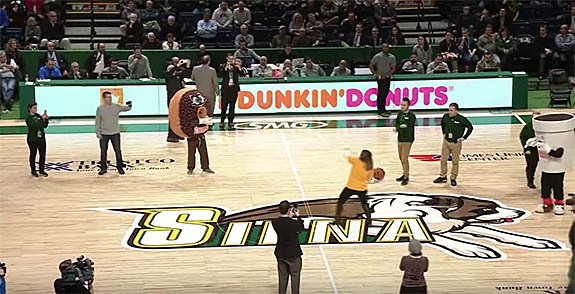 Duckett would pose as the Dunkin' Donut mascot while Tobin, a 2008 Siena graduate, would get an opportunity to hit a half-court shot. After the shot, Duckett would strip off the mascot costume and propose to her in front of 5,500 fans. All this would have to happen quickly, because the events were set to take place during a timeout, not during halftime. On Thursday, Duckett and the PR staff put their plan in motion. The only thing they didn't expect was that Tobin — a former high school basketball player — would make the shot. The Albany Times Union reported that in the days leading up to the halt-court attempt, Tobin was allowed to visit the Times Union Center to take a few practice shots. Apparently, one barely reached the end line and another was wide by a mile. Tobin's brother joked that he pay her $50 if she could even hit the rim during the game. In a 32-second YouTube video that has been viewed more than 250,000 times — including high-profile appearances on Good Morning America and ESPN's SportsCenter — Tobin is wearing a golden Siena Saints T-shirt as she stands at center court, takes one stride and launches a right-handed fling. The ball takes a high arc, banks off the backboard and then right through the net. The school's announcer can be heard exclaiming, "It is up. It is good, good." Duckett told the Times Union that the visibility within the mascot outfit was very limited. When Tobin, 30, hit the shot, she the threw up her arms and danced out of his view. "I couldn't see her!" Duckett said. "She makes the shot, and then for me, she disappears. I can't see out the sides of Cuppie. I didn't know where she went." 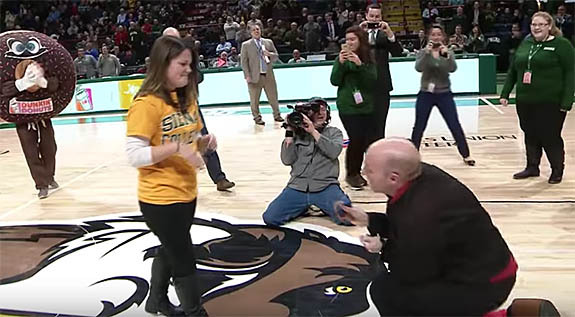 The Siena College PR staff was able to guide the excited girlfriend back to center court, where Duckett — still disguised as Cuppie — was already down on one knee. A moment later, the costume was lifted to reveal Duckett with a ring box in his hand. He quickly popped the question (this is all taking place during a timeout of a live game) and Tobin said "Yes." "I was jumping up and down after hitting the shot since my brother said he'd give me $50 if I even hit the rim," Tobin told the Albany Times Union. "And then I turn around expecting a gift card from Dunkin’ Donuts and there he was on his knees and I didn't have any words." 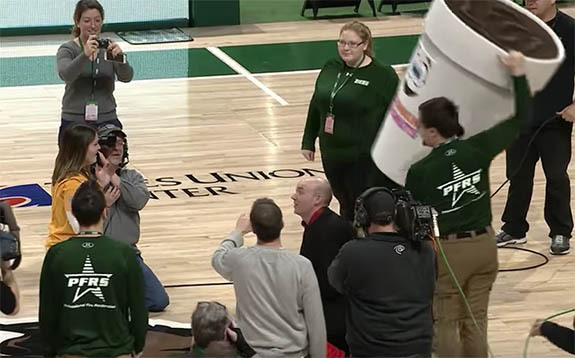 The announcer summed it up for the fans: "The cup of coffee was so excited, he wants to marry that girl that just knocked down a half-court shot." 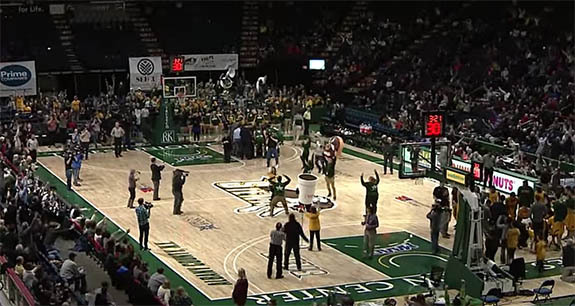 It was a great night overall for the couple and their favorite team, as Siena College defeated Manhattan 94-71. Check out the awesome video, below.